* Update: Hackney Homes/council duly sold the house. It was then superbly restored in line with conservation-area requirements and successfully let. 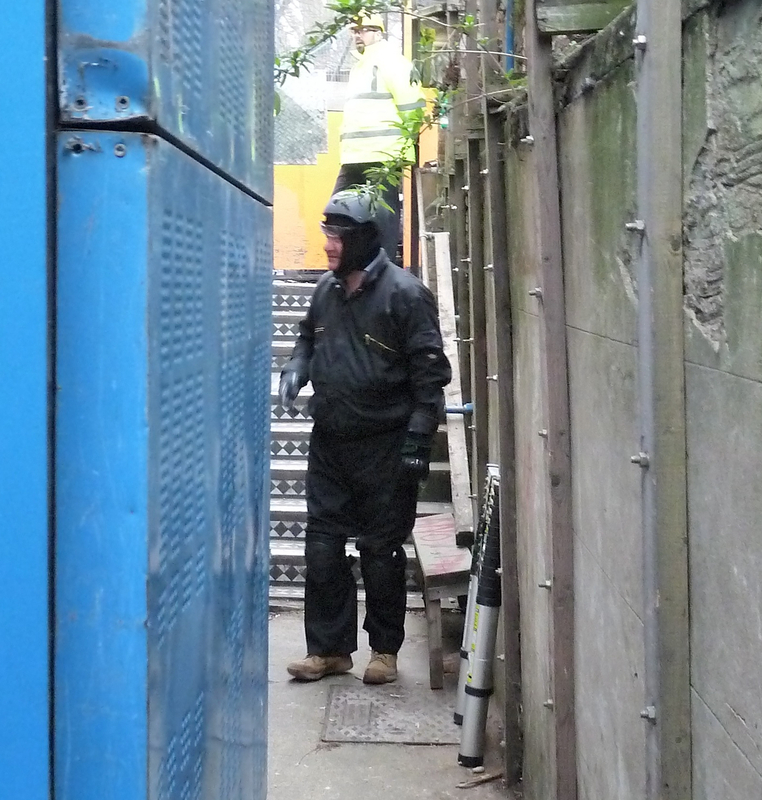 SQUATTERS have been evicted from the grand house at 5 St Mark’s Rise on the corner of Colvestone Crescent in Dalston. The ten young residents left peacefully. A tip that Hackney council would make its move early today 2 March 2012 turned out to be accurate. The squatters, who had lived in the Victorian house for more than three years, will be replaced by what are termed “property guardians” – licensed squatters. Then the property will be sold to a private developer. A town hall source told Loving Dalston last October that fire damage had made the property “structurally unsound”. The squatters, however, continued to live there, and run a successful vegetable garden at the rear, for a further five months. The council’s claim of fire damage could be used to justify a future owner’s applying to demolish the sturdy house and build new flats. 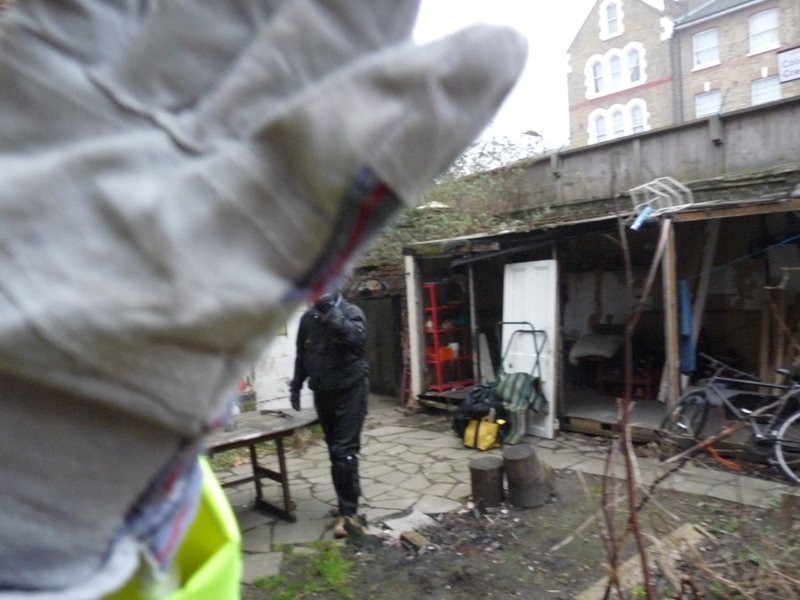 The squatters said they would move to accommodation offered by friends in other London squats. Bailiffs spent the rest of the day making the property squatter-proof. Rueben Taylor, of Squatters’ Action for Secure Homes, said: “This is a sad example of policies that force people on to the streets just to increase profit. With homelessness up by 23% in the last year, and a million young people without work, there could not be a worse time to launch an attack on some of the most vulnerable members of society. Clara, you are right that property guardians are in no way squatters – you are anti-squatters, unpaid security guards. But you have something wrong: the “spaces” you live in are not the slightest bit interesting, they are the end of anything interesting. You might think it makes you seem interesting to live in a building that is falling apart, or that was never intended to house people, but you’re put in that building precisely to ensure that nothing interesting happens there. You are helping the police to protect the big landlords from everyone else and from the possibility of anything else. Meanwhile you are being charged for the pleasure. That is about as uninteresting as it gets. I am a property guardian in Hackney and we are in no way squatters. We are legally renting the property and protecting it. We pay council tax and domestic bills. As KK says, we pay less rent as we have to move a lot because of redevelopment. The trade-off is that we get to live in interesting spaces. It was particularly endearing for those of us who live near this house to read the manifesto the squatters had stuck to the hording outside the building. They refused to take a job because that would be participating in a system they did not believe in. Let the rest of us who pay council tax make sure that the pavements, roads, parks and libraries near your free Hackney home are maintained. Freeriders can afford to stick it to the man. I live next door. Right now, security is in, with three massive guard dogs, banging around. How lovely. Thank you, Hackney Homes. “Squatters.. will be replaced by what are termed ‘property guardians’ – licensed squatters”, you write.